Beyond your qualifications there will be one question during your law firm interviews that will be the most important in you getting a job. That question will entail where else you’ve interviewed for a law firm job. Knowing how you should answer this question may have a direct bearing on whether or not you receive a job offer. Should You Talk About Other Interviews in Your Interview? One of the questions I receive quite often from the attorneys I work with is whether or not they should talk about other interviews while they are interviewing with law firms. Let me emphasize one thing: This is one of the more important law firm interview questions you will have to answer. Regardless of your qualifications, how you respond to this question will have a direct bearing on whether or not you receive an offer from the law firm interviewing you, so you have to be very careful with your answer. In no instance should you ever volunteer this information unless you are asked, but many law firms, though not all, are asking it. At the outset, it is important to point out that you do not have to answer this question, but not doing so is likely to make you look bad, as it gives the employer the impression that you will similarly "hide the ball" when you are working for it. It also does not do much to help you establish a bond of trust and understanding with a potential new employer. Therefore, it is my opinion that this question must be answered, even though it is probably inappropriate for an employer to ask. First, most firms are unlikely to give you an offer unless they believe that they are your first-choice firm. There are certainly exceptions, however, and as a legal recruiter, I see them constantly. Many firms are very good at recruiting and can convince most anyone to join them whenever offers are extended, even in the face of competing offers. Nevertheless, a firm wants to believe that your first choice is to work there, and this often will have a direct bearing on whether an offer is extended. Second, how you justify your reasons for interviewing with the firms you are interviewing with will also affect whether or not the firm makes you an offer. In addition to knowing that they are your first choice, law firms also want to know that you are likely to remain with them after joining. Therefore, explaining to the firm why it is the best fit among potentially competing offers is crucial. Furthermore, the law firm wants assurances that it is not making a mistake by offering you a position. I have a quick story from personal experience that is related to law firm interviewing, albeit indirectly. I am a Los Angeles Area Chair for the admissions office of a major American university. In this position, I am largely responsible for ensuring applicants to the University in my area are interviewed. While I am not the one making the ultimate decisions as to whom the school admits, I do put together reports on everyone I speak with and express my enthusiasm (or lack thereof) for each applicant. This year, I probably interviewed 50 students for the school, which is generally ranked as a top-10 American college, though it has been slightly lower in some years. As is typical of most college admissions interviews, I speak with the high school students about their dreams and aspirations for college and ask them why they are interested in attending the University. Because I also attended the school, I have a decent understanding of the sorts of students that are likely to be happy and fit in well there, and these are generally those students who seem the most enthusiastic and give me the most compelling reasons for wanting to attend. One challenge of these interviews is trying to decide which of these highly qualified students really want to go to the school. If someone is not qualified for the school, my job is easy because I know he/she will be rejected. Because the University is a highly ranked school, the majority of students I speak with inevitably are applying to schools like Princeton, Yale, and other similarly situated schools. Accordingly, one of the first questions on my mind is this: Why are you interested in my school and not another highly ranked one? This situation is compounded by one obvious fact: While I certainly believe the school I am interviewing for is the top university in the United States (and could argue convincingly about this all day), it is not the number-one-ranked university and never has been. Now, if I were interviewing for a university consistently ranked number one in the United States, I would think that the university was every student's top choice. Because it is not the top university, I know that several people I am speaking with would probably rather go to a more prestigious university. Now if you think about this, this rationale is very similar to what goes on when law students and attorneys are interviewing with law firms. In an extreme example, if you are interviewing with Skadden Arps Slate Meager & Flom ("Skadden") and a small, 15-person law firm in New Jersey that pays less than half of what Skadden does, most rational observers would presume that you would rather go to Skadden. Imagine for a moment what the 15-person law firm is thinking if you tell them that you are interviewing with Skadden. That firm instantly feels like a backup. Now imagine what Skadden is going to think if you tell them you are interviewing with the small 15-person law firm. They are likely going to think that you are either desperate or that Skadden is a reach for you. You need to put yourself in the shoes of the person making hiring decisions because what he/she thinks will determine whether or not you are ultimately hired. Why do I ask myself if the student really wants to attend the university I am interviewing for? Because I want to be sure he/she is likely to attend the school if I put a strong recommendation behind the person. Do not get me wrong: If you are a stellar applicant, you will still get a stellar recommendation. However, someone who really wants what you are offering is always going to be far more attractive than someone who does not. What the university admissions officials do with this information is their business. However, I do like to be able to say "the university is this person's first choice, and I am confident he/she will come if admitted. I believe the applicant's statement that the school is his/her first choice because of X, Y, and Z. Furthermore, this person is the sort of person I imagine would do quite well there because he/she shares so much in common with others students I knew while there." When a law firm is interviewing you, the same sort of logic applies. Law firms are constantly receiving applications from highly qualified individuals, and if a law firm thinks you will never take an offer from it, it is not going to be interested in speaking with you. 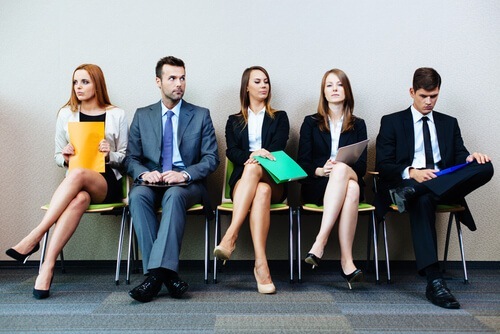 In the event you do get an interview, if the law firm thinks you are just looking to go to the most prestigious firm you are interviewing with (and it is not the most prestigious), then it will probably not make you an offer. This is one of the most important tips for college interviews and law firm interviews you need to remember. As an aside, I should note that I deal with attorneys at some of the top law firms in the world on a daily basis. Many of these attorneys want to go to smaller firms that pay far less. While most of these attorneys are under the impression that the smaller firm would "die" to have them, the opposite is usually true. If the attorney is coming from a far more prestigious law firm, the smaller law firm and its attorneys might be intimidated by hiring the attorney if he/she has no experience in a small-firm environment. People do not like to spend time with those they think (or others think) are superior to them. I am an expert in getting attorneys jobs inside law firms; and in this work, I have seen that law firms always want to save face, no matter what the situation. Having someone take another offer over its own makes the law firm feel rejected and inferior-as if the law firm who "won" the candidate is a more attractive alternative. It is a negative vote of confidence from the candidate if he/she does not take an offer if one is extended. So how does the question of which law firms you are interviewing with fit into the equation? First, you have to answer this question if and when and it is posed. Before you ever answer this question, though, the law firm you are interviewing with must-and I mean must-know that it is your first choice. If the firm thinks this, then telling it the firms with which you are interviewing can help you. Back to the situation with the 15-person New Jersey firm. You could still very easily get an offer from this firm if you play your cards right. First, you need to walk into this interview and convince the firm that you really want to work there. Whether it is because you know someone at the firm that has said good things about it, the firm practices in an area of law you have long been interested in, or its office is right across the street from your house-you need an arsenal at your disposal to give the law firm a compelling reason for hiring you. If you give the firm enough reasons that you are a good fit, it will look upon the fact that Skadden is interviewing you as something that verifies your worth in the market. The firm needs to think that you will choose it over Skadden. If you take an offer from it over Skadden, it will be a major vote of confidence that the firm will use to impress upon its attorneys as to what a great place to work it is. When I am interviewing college candidates, I can answer the question of whether or not they are really interested in my opportunity in several ways. For example, if the student has a 1580 on his/her SAT, is captain of the debate team, student counsel president, and first in his/her class, and my school is the only top school he/she is applying to, then my job is easy. The student is likely to be most interested in what my school offers. Even if the student is applying to several more prestigious schools, I can still judge whether or not this same applicant really wants to attend my school by several methods: (1) if the applicant's parents went to the university and the applicant has always wanted to go there, (2) if the applicant attended the university for summer school, (3) if he/she worked for a professor of the university during high school, and (4) if his/her life has been profoundly influenced by the work of some professor of the University. You get the idea. The point is that your interviewer wants to say, "I believe that this school is the applicant's first choice." A law firm wants the same assurances that they are your first choice. These assurances need to be given at the interview stage, and they need to be given early on. This is not an article about interviewing. I can tell you, though, that when a law firm believes it is your first choice, you will have a better chance of getting an offer with the firm. There are several scenarios that you could be in when asked this question, and each one merits a separate response. If you have prepared for the interview properly, you will do very well when asked where else you are interviewing. The potential scenarios are (a) you are not interviewing with any other employers; (b) you are interviewing entirely with less prestigious firms; (c) you are interviewing with a mix of firms, corporations, and other types of employers; (d) you are interviewing with a mix of more prestigious and less prestigious firms; and (e) you are only interviewing with more prestigious firms. Given the importance of each of these hypothetical situations, they will all be discussed separately. If you are not interviewing with any other employers, then you should tell the firm so. If you are in law school and this is occurring, the firm should be under the impression that you are just starting the interview process. Employers do not want to feel as if you do not have any options. It makes you look loyal to your current employer. By stating that you are interviewing with only one employer, it makes it seem as if you are not doing an all-out search to find new positions. You are only interested in this one interview because the firm matches what you are seeking so closely. It makes the firm confident you will take its offer. By having only one interview, the firm can give itself more assurances that an offer will most likely be taken. The firm is confident it will not lose out to a competitor. If you inform the firm that you have only one interview, the firm will have the assurance that it will not lose face if you take an offer from one of its competitors. The law firm could think that you will take its offer if it is the most prestigious option of the firms you are interviewing with. If the firm is more prestigious than the one you are currently at, the employer will think that you are trying to move up. It is almost axiomatic in American culture that we respect individuals who are trying to move up and improve their lots in life. Though there can be positives, an interviewer faced with an attorney who is considering firms that are beneath the interviewer's firm is likely to have negative thoughts about it without a proper explanation. Here, the interviewer will certainly think to himself, "Can't this attorney get an interview with better firms? Is there something wrong with him/her that we are missing?" In this situation, you need to be very careful and come up with a way to put the situation in the best light. One way to approach this is to state that you only are applying to places with openings and these are the only firms you are aware of with openings. In this way, the firm will believe that you are applying to these other firms and its firm simply in response to what you know. You may have applied to more prestigious firms and have not heard back or were rejected, but you do not need to make the firm aware of it. The most important thing you can do in this situation is to make it clear to the firm that you are qualified to work for them. For example, if you are interviewing with less prestigious firms that pay far less, then tell the more prestigious firm that money is not a concern for you. Here, you can tell the firm you are most concerned with finding the right fit and that the less prestigious firms have a lot of attributes that might not be immediately apparent. In this instance, you have cast yourself as someone who is more concerned with practicing law in the right environment than someone who is concerned with making as much money as possible. This sort of characterization can only help you. There are many ways to get creative with this response. In sum, the most important thing you can do in a situation where all of your interviews are with less prestigious firms is to make the firm aware that (1) you are very interested in it, (2) seeking to move up, and (3) most concerned about finding a good fit. It can also be a potential problem for you if you are interviewing with different classes of legal employers because of how law firms view themselves in relation to other industries. Most law firms have a billable hour requirement, have a division between partners and associates, encourage you to develop business, and so forth. While I have written extensively on this topic before, the point is that law firms are unique institutions that have great respect for their own way of practicing law and look down on those who do not practice law under their methodology. For example, many law firm attorneys consider government attorneys to be lazy bureaucrats and look upon going in-house as a way to escape the pressure of law firm life. While these generalizations are not necessarily true, law firms do believe that individuals that do not want to practice inside a law firm are not cut out for law firm life. Accordingly, telling a law firm you are interviewing with the government or an in-house employer is not necessarily in your best interest. How you address this question is up to you. You must tell people where you are interviewing. If you are asked what other law firms you are interviewing with, tell them what other law firms. You need to be honest with employers, and not doing so is not only ethically wrong, but will come back to haunt you. If you are interviewing with an employer that is not a law firm and are asked about this, you are going to need to let the employer know why you are going out on these interviews. There can be many potential explanations. Perhaps a friend asked you to interview with an in-house employer, or you are interested in environmental law and interviewing with the environmental branch of the United States Department of Justice so you can get more experience doing environmental trials. Whatever the explanation you give for these other interviews, it is essential that you let the firm know that (1) a law firm is your first choice and (2) the other employer represents an opportunity for you to get significant experience and move up in terms of your skill level. In any law firm interview you go on, one of the most important things you can do for yourself is to leave the firm with the impression that your actions in seeking to leave your current employer are motivated to move up and become a better attorney. However you phrase the fact that you are not interviewing exclusively with law firms, this point needs to be made. Law firms want to hire winners. The fact that you are interviewing with different kinds of legal employers leaves a lot of potential doubt in the law firms' minds as to whether or not you are not committed to practicing law in a law firm. Make them think the alternatives you are exploring to this are just as demanding. This situation is the most normal for attorneys interviewing with law firms. Most attorneys that are interviewing are speaking with more prestigious and less prestigious firms. Here, your case does not need to be as compelling about why you are interviewing with the firms you are, but the employer still must be left with the impression that it is your first choice. In addition, the employer must have a basis for understanding why you are interviewing with more than one firm. It would be good for you to come up with law firm interview questions you want to ask the firm, as well. This will show you have interest in them. Assuming that you have done your job of giving the employer the impression that it is your first choice, the employer should also understand why you are speaking with so many different sorts of law firms. Here, the employer needs to be aware of why you are doing such a broad search, which usually means it wants to know why something is seriously wrong with your current employment situation. This is a delicate topic. In all interviews, you never want to leave the employer with the impression that you harbor any sort of ill will toward your current employer. Employers typically do not like attorneys who say bad things about those they work for because they believe that they could one day be on the opposite side of this. This simply makes you look bad. What you need to do in the interview, though, is convince the employer that your current employment situation is preventing you from reaching your full potential. You need to project that you are leaving your current employer because you are trying to get upward momentum. While your decision to join your current employer was a good one, you have continued down a path of growth that you have been on from the very beginning. While it is unfortunate, your current firm is limiting your growth potential. The environment of the firm you are interviewing with offers this growth potential, and that is why you are speaking with it. In fact, the growth potential of the firm you are interviewing with is hands down the best of the bunch in terms of the other employers you are speaking with because of X, Y, and Z. If you were in charge of determining whom you were going to hire, which candidate would you want to hire: (1) someone without compelling reasons for being interested in your firm or (2) someone who needs the environment your firm offers to grow? I am sure you can see the logic of this. It is a fundamental human characteristic that we want to feel good about ourselves. Finding someone who needs an organization like ours to thrive and letting them work with such an organization is something that makes hiring authorities feel good about themselves. You need to give employers compelling reasons for hiring you. Moreover, proclaiming upward mobility as a long-held career goal makes you sound like a winner. Given what has been said above, this section should not require a great deal of analysis. Here, you want to make the law firm believe that it is your first choice and that you will accept an offer from it if extended. The firm needs to feel special and understand your reasons for choosing it over competing opportunities. How you address where else you are interviewing will play a major role in whether or not you are hired. This, in fact, is one of the more important secrets to interviewing effectively. If there is one thing you take from this article, it should be this: Always make the firm you are interviewing with feel like that firm is your first choice. The interplay of law firm questions and answers will undoubtedly be a big determining factor in how you fare with the firm.